The 2013 Distinguished Service Award recipients demonstrate legislative leadership at its best. They addressed a significant state-wide problem, without a direct self-interest, and to assemble and hold together a coalition of legislators to pass significant legislation that changes and improves the direction and outcomes of education for Minnesota. 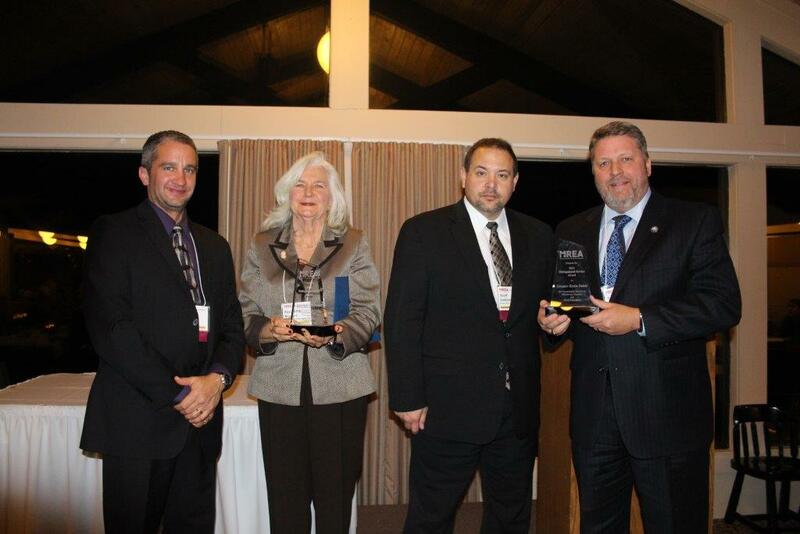 Pictured (left from right): Mike Vasek, vice chair of the MREA Board Directors; Rep. Kathy Brynaert, 2013 Award Recipient; Scott Vedbraaten, chair of the MREA Board of Directors; Sen. Kevin Dahle, 2013 Award Recipient. Representative Brynaert did her homework by serving on and attending the Assessment and Accountability Task Force meetings in the summer and fall of 2012 where these recommendations were researched, discussed, developed and submitted to the Commissioner of Education in December of 2012. During the 2013 session, Rep. Brynaert became the Chief Author of this bill, working closely with Sen. Kevin Dahle who was the Senate Chief Author. They worked informally and effectively to submit nearly identical bills and shepherd them through the committees, the floor debates, the conference committee, final passage and to Governor Dayton for his signature. Active in her local community, Brynaert has long been an advocate for youth, serving as a member of the Educare Foundation, as Youth Service Committee chair for the Downtown Mankato Kiwanis, as a founding member and chair of Mankato Area Healthy Youth, and as chair of the ‘How Are the Children?’ Project. She was co-chair of the Envision 2020 Transportation Committee in 2006. Sen. Dahle is a social studies and driver’s education teacher at Northfield High School in Northfield. He was a member of the Council of Local Presidents of Education Minnesota, a trade union representing local teachers in Minnesota, and was also president of the Northfield Education Association for approximately ten years. He previously worked with Citizens for Quality Education, and also worked for the U.S. Department of Education as a liaison in the Ukraine, where he taught civic education.